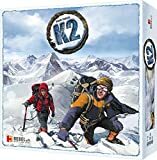 In K2, each player directs a team of two mountaineers who in competition with other teams are trying to reach the peak of K2 and survive until the end of an 18-day expedition. Important elements include selecting a suitable route to the summit, blocking other players, placing tents optimally, and paying attention to the weather, which significantly affects the difficulty of climbing to the summit. 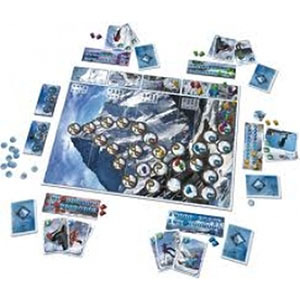 Players will move their mountaineers on the board with cards which they play every turn. The higher a particular climber goes, the more victory points the climber earns at the end of the game - but in the upper parts of the mountain one must be careful about a climber's acclimatization level. 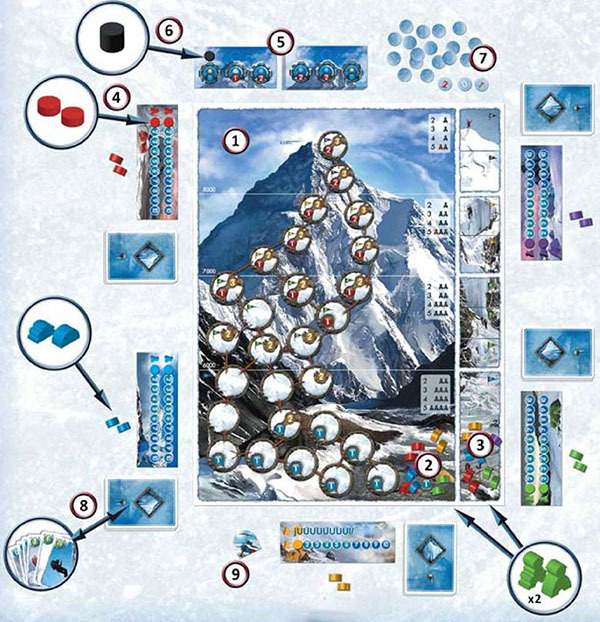 If it falls below 1, the exhausted mountaineer dies, and the player receives no victory points gained by that climber. For the first game, we suggest using the easier board. a set of pieces (4 climbers, 2 tents, two acclimatization markers). a rescue card (only when playing the family variant). The acclimatization markers should go on the player mats, on the spaces with value "1" 4. 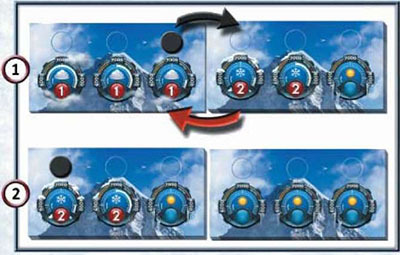 One of the sets of weather tiles (summer - easier, or winter - harder) should be chosen for use in the game; the unused set can be set aside in the box. The weather tilesets can be freely combined with the easier and harder sides of the board. During the first game, we suggest the summer weather tiles. The game is played for 18 turns (an 18-day expedition). Each turn is divided into several phases, played one after the other. Most of the phases are played by all players simultaneously, except for phase 3. All players select 3 out of their 6 cards in their hand and place the 3 cards face down in front of them. When all players have chosen their cards, they reveal them simultaneously. Players add up the movement points on their 3 selected cards. For rope cards (with different movement values up and down), only the upward movement value is added. Acclimatization cards are not counted. The player with the highest sum chooses one of the three visible risk tokens and puts it beside their 3 selected cards for this turn. In the action phase (phase 3), the player must take the risk token's effect into account. In the case of a tie for the most movement points, none of the players takes a risk token. Example: Brian played two cards with a movement value of 1 each and a rope card with a value of 1 (up)/3 (down). Anna played two movement cards, one with a value of 1 and one with a value of 3, and an acclimatization card with a value of 1. William played one movement card with a value of 2 and two acclimatization cards, one with a value of 2 and the other with a value of 1. Brian's total risk is 3 points, Anna's is 4, and William's is 2. In this situation, Anna must choose one of 3 revealed risk tokens. Then one of the hidden risk tokens is drawn and placed face up so that once again three risk tokens are visible. In this phase the players play one after the other, starting with the player with the starting player marker, and then going clockwise. Players can do more than one action as long as they have enough cards. A player who holds a risk token during their turn will have to suffer the consequences. A player can use movement cards to move a climber with the given number of movement points (shown on the cards), up or down. A climber can move only between adjacent spaces (shown connected with rope). The cost to enter a space is marked in a yellow circle in that space. If the space has no cost shown, then it costs 1 movement point to enter. 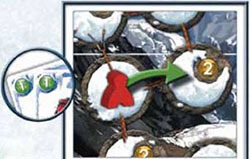 To do this, a player indicates the mountaineer who will move and the card or cards to be used. The amount of usable movement points is the sum of the movement points on the indicated cards (the values in the green circles on the cards). A rope card gives movement points in one chosen direction; use the points beside the up or down arrow. For other movement cards, the number of points does not depend on the movement direction (they can be used for upward and downward movement). During a single move, it's also possible to change direction as desired, e.g. move up and then down. Movement points from one card may not be divided between two climbers. It's not required to use all movement points, and it's legal to not move a climber at all. Example: Brian played two cards, both with movement values of 1, and a rope card with a value of 1 (up)/3 (down). Using them, he moves one of his climbers higher using 2 points up (to enter a space which costs 2) and moves his other climber lower using 3 points (entering 2 spaces which cost 2 and 1 respectively). A given space can only have as many climbers as indicated in the table on the board. Next to the number of players in the current game appear figures indicating the maximum number of climbers in a space in the given altitude zone. Above 7000 meters with 5 players there are additional figures in red. Players should agree before play whether to use the larger maximum number of climbers (easier) or the smaller maximum number(harder). Example: In a3-playergame each space in the zone between 7000 and8000 meters above sea level can have at most 2 climbers. A climber can pass through a space with the maximum number of climbers, paying the appropriate number of movement points, as long as the climber doesn't stop there, but keeps moving. Every time a mountaineer successfully goes higher (to a space with more victory points), that climber s marker is moved up the victory point track to the corresponding value. When a climber goes lower, the corresponding victory point marker does not change its position - it stays at the maximum reached so far. The victory point marker of the first climber to reach the peak is placed at the top of this victory point space - climbers who reach the peak afterward arrange their markers in order below it. 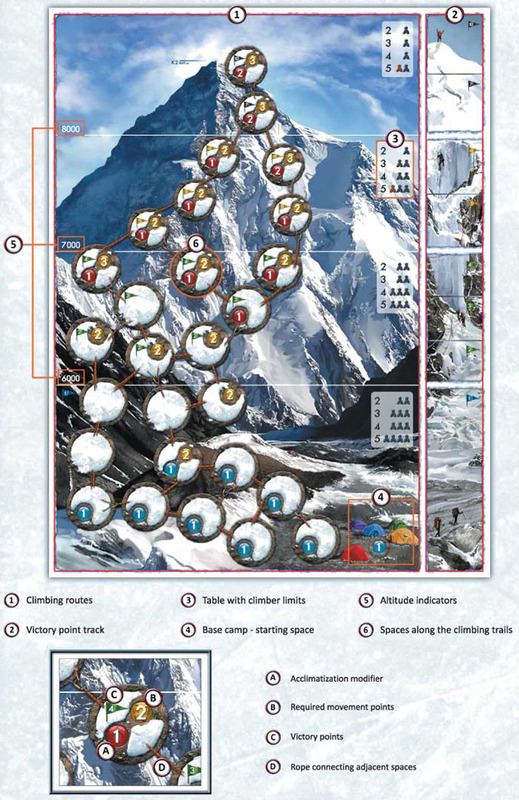 A player adds acclimatization points to climbers according to the played cards. Points from one card can not be divided between 2 climbers, but 1 climber can receive points from multiple cards. Points are added by moving the marker on the player's mat on the track corresponding to the given mountaineer. A mountaineer can pitch a tent on their current space, spending as many movement points as the space's entry cost. In the case of rope cards, only upward movement points can be spent on a tent, not downward movement points. Each climber can pitch only one tent during the game - place the climber's corresponding tent. A tent can not be moved - once placed, it remains in that space until the end of the game. With enough movement points, a climber can enter a space and place a tent there in one turn. A given space can have more than one tent. Example: Wiliam played one movement card with a value of 2 and two acclimatization cards, one with a value of 2 and the second with a value of 1. Because his climber at 6500 meters is exhausted, William uses the cards to raise that climber's acclimatization level by 3 points. Then he moves his other mountaineer onto that space (which costs 1) and places a tent there, in which both climbers can seek shelter. If a player has a risk token, it must be applied. If the token has a value of 0, nothing happens. subtract 1 point from the acclimatization level of a mountaineer to whom at least one card was assigned this turn. 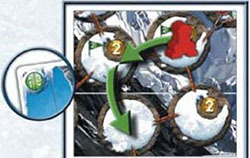 In the case of rope cards, the player must decide whether the climber will use it to move up or down, and subtract the risk token paint from the selected value. 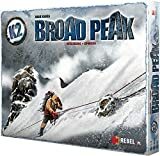 A mountaineer who does not move in a given turn and who did not receive acclimatization points can not suffer the consequences of a risk token. If the risk token has a value of 2, the player must subtract 2 points as described above. The player can divide the penalty points between movement and acclimatization points, and even between climbers. Remember that the penalty can only be applied to a mountaineer who is moving or getting acclimatization points due to card play. Example: Anno played two movement cards, one with a value of 1 and one with a value of 3, and an acclimatization card with a value of 1. She has the highest total of movement points among the played cards, so she has to take a risk token, and, sadly for her, they all have value 2. Thanks to the cards played (movement 1, acclimatization 1) she moves one of her climbers with 1 movement point and adds 1 point to the acclimatization level. She decides to use 1 point of the risk token by subtracting 1 from that mountaineer's acclimatization level. The second point from the risk token is used by subtracting 1 from the value of the movement 3 card, then moving her second mountaineer into a space costing 2 and stopping there. Each weather tile shows the weather forecast for the next 3 days. Each forecast gives information about the weather which will affect a given altitude zone (or zones) and about the effects (modifiers) which mountaineers in this zone will suffer. The marker on the weather tile shows the current weather conditions for climbing. Red circles are acclimatization symbols with the number of points which every climber in the given altitude zone (or zones) must subtract from their acclimatization level in phase 4 (acclimatization checks). This means entering every space in the given zone costs the indicated number of additional movement points (both when moving up and down). Note: This also applies to placing a tent. This means that both symbols work at the same time, according to the descriptions above. The indicator on a weather tile tells us which zones are affected. Each part of the dial corresponds to an altitude zone on the board. In the adjacent illustration, the cloudiness and negative acclimatization modifier affects two altitude zones: 7000-8000 meters and over 8000 meters. After all players have performed the actions from their played cards, there are acclimatization checks. Checking each climber separately, add or subtract the appropriate number of acclimatization points by adjusting the marker on the climber's track on the player's mat. If the climber is on a space with favorable acclimatization (blue circle), then add as many acclimatization points as indicated by the number in the circle. If the climber is on a space with unfavorable acclimatization (red circle), this number should be subtracted. If the space has a tent with the same color as the climber (not necessarily that specific climber 's tent), the climber gains 1 acclimatization point. If the current weather affects the zone where the climber is, then the climber loses the indicated number of acclimatization points. At the end of this phase, check whether climbers' acclimatization levels are greater than 6. Any which are higher than 6 are reduced down to 6. If any climber's acclimatization level drops below 1, that mountaineer dies. 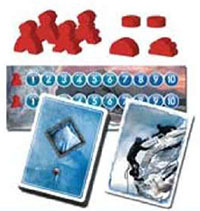 That climber's victory points are reduced to 1, and the climber is removed from the board. Example: One of Brian's mountaineers has an acclimatization level of 3. He is on a space with negative acclimatization (-1) in the altitude zone above 7000 meters, which is affected by the current weather (-2). Fortunately, he is in a tent (+! }, and therefore loses a total of only 2 acclimatization points. Next turn Brian will need to do something to help this mountaineer - otherwise, he will not be able to survive another day. 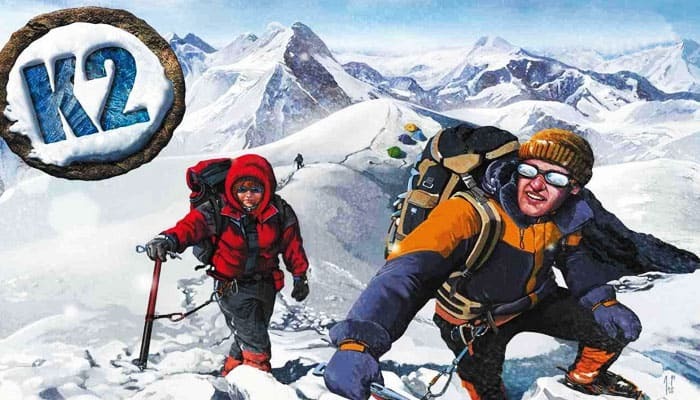 If players decide to play the family variant, then at the moment a climber dies, the player can use their rescue card to save the climber, moving the climber to any space at an altitude below 6000 meters. The victory point marker for that climber must be moved backward 4 spaces. The rescue card can only be used once - after this use, it is discarded to the box. Strategy advice: Remember that mountaineers must not only reach the summit but also survive to the end of the game - a climber who dies gives only 1 point. Therefore after reaching the peak, or attaining a good altitude, it Is usually good to go back down to a place where the mountaineers can shelter against the bad weather and the destructive influence of negative acclimatization. The player to the left of the starting player receives the starting player marker. This new starting player will start playing the card actions first in the next tum. The weather marker should be advanced to the next space on the weather tile. If it moves onto the first space of the weather tile on the right side, then move this tile to the left side, revealing a new one on the right side, as shown in the picture. if the marker is moved onto the last tile weather (you can not reveal a new tile), then only 3 days remain until the end of the game. After moving the weather marker, all players draw 3 more cards to have 6 in their hands. If there are no more cards to draw, then in the next turn players will have only 3 cards to play. Only when the players have no cards left in their hands do they shuffle their cards and draw 6 new cards. A new turn begins (with phase 1 - card selection). The game ends at the end of the last (18th) day - when all weather tiles have run out. Whoever has the highest sum of victory points from their 2 mountaineers is the winner. If several people gained the same amount, the winner Is the person (among those with the most points) whose climber reached the peak first. That is indicated by the order of markers on the peak's victory point space. Otherwise the players with the highest total points tie. You can also play K2 solo. The game rules are the same as usual. The maximum number of climbers in a given space is the same as for the 2-player game. The player always takes a risk token, no matter what cards are played. If one of the climbers dies, the game ends immediately, and the player gains as many victory points as the surviving climber scored, plus 1 victory point for the dead climber. Then the player compares the number of victory points with the table below to find out the victory level achieved.